Education activist Mike Hutchinson said he thinks the charter school will undermine nearby district-run public schools. Under the proposed terms of the deal, the city will sell a 9,000-square-foot parcel on Derby Avenue between International Boulevard and E. 15th Street for $450,000. The buyer, an Idaho-based company called Pacific West Communities, Inc. plans to construct a new school campus on the site for the Aspire charter organization's ERES Academy, a K-8th grade school. The campus was approved by the city planning commission last month. ERES Academy's staff say the new facility is critical because the building they're currently in — located one mile away on Courtland Avenue and leased from a church — is too small. "The physical nature of the classrooms is super-constrained," Aspire's Dean of Students Jesse Johnson told the city planning commission last month. "The children are bumping into each other. It's crammed." City staff say the land deal will put the property, which used to be part of an auto dealership, back into productive use, and that new charter school is in the public's interest. They also say the city is coming out financially ahead by selling the land. In an interview, Mark Sawicki, Oakland's director of economic and workforce development, said that the 9,000-square-foot parcel was acquired for about $250,000 back in 2010, so the city stands to earn about $200,000 on the sale. But not everyone agrees that the land deal is a proper use of city resources. "The city should not be selling land to a private school, that's what a charter school is," said Mike Hutchinson, an education activist who unsuccessfully ran for the school board two years ago. Hutchinson said the city's financial assistance in assembling land for the charter school to rapidly grow will undermine nearby district-run public schools, which could see their students siphoned off. "This school is going to be placed two blocks away from our Cesar Chavez campus, two blocks away from International Community School and Think College Now, and the field that this city invested money in," said Hutchinson, referring to a publicly funded sports field. Over the past year, OUSD — which is a separate government entity from the city — has had to make painful budget cuts. At the same time, the district's directors have denied new charter school applications on the grounds that the growth of charter schools can at times destabilize the public-school system's finances. Housing activists are also concerned about the process by which the city selected the developer and charter school. They say that despite working with the city for almost two years to try to formulate a public lands policy that includes public input from the earliest stages, and prioritizes affordable housing, the city still has no overarching guidelines with respect to how city property is used. "They're following a flawed process and it's continuing to give them flawed results," said Krishna Desai of the E. 12th Coalition, a group that formed two years ago to oppose an exclusive land deal involving city-owned property near Lake Merritt that the council wanted to sell to a private developer for market-rate apartments. Desai and others have been asking the city to adopt a policy that would involve public disclosure of all city-owned properties and facilitate discussions with neighbors and community organizations about what should be done with city-owned land long before city staff issues competitive requests for proposals from developers. The city's existing practice for much of its portfolio of public land is far different than what Desai and others want. For many years now, Oakland city staff have accepted unsolicited proposals from developers and pursued these plans in private meetings. Later, city staff unveil a single option to sell land to a pre-selected developer, and the council votes on whether or not to approve exclusive negotiations. This practice prevents competitive bidding among multiple developers for control of the property. If exclusive negotiations are approved, city staff then work privately to finalize terms, which come back for one more public council vote. The Alameda County Grand Jury has criticized this method of developing city property, calling it "backroom dealing." "This conduct precluded participation by the public in determining the best use of city-owned property and the selection of developers," the grand jury wrote in a report issued last year that examined three public land deals involving exclusive negotiations. Oakland City Council President Larry Reid responded on behalf of the city council to the grand jury's report in January. He wrote that the council disagreed with the grand jury's main findings and declined to modify the city's procedures. Sawicki also disagrees with the characterization that Oakland engages in backroom deals. "This particular property did go to committee and council two and half years ago," Sawicki said about the Derby Avenue parcel. "That was the opportunity to talk about the use — should we sell at fair market value or should we sell it for affordable housing. Now the developer has put money up and gone to the planning commission and gotten approvals, so then to have those kinds of fights at a council meeting, that's the inappropriate time," he said. But affordable housing activists say the city didn't give the public enough time to weigh in on the deal. They say the city needs to do much more community outreach than simply holding one committee hearing and one council meeting in order to get public input about what should be done with a particular property. In the case of the Derby Avenue parcel, city staff made a ten-minute presentation at a council committee meeting on a Tuesday afternoon in September of 2015. The proposal then went on the city council's consent calendar and wasn't discussed at the full council meeting the following week, when the exclusive negotiations were approved. David Zisser, an attorney with the nonprofit public interest law firm Public Advocates, said the Derby Avenue land deal caught him by surprise, despite the fact that he closely follows such public land deals. He also said the city still isn't applying the state Surplus Land Act to many of its properties. The law defines surplus public land as any property that is no longer being used by the city for a governmental use, such as for a city building, park, or parking lot. It requires extensive public noticing that the land is for sale and prioritizes affordable housing on city-owned sites. City staff don't think the Surplus Land Act applies to the Derby Avenue property. A draft resolution recently prepared in anticipation of the sale states, "the Property has not been in the city's use" and therefore isn't surplus. Instead, city staff wrote in a report that it was acquired under auspices of the redevelopment agency with plans of developing it. The city's involvement with the Derby Avenue property began in 2010 when the Melrose Ford auto dealership closed. The city purchased the former dealership, including a second larger parcel located across Derby Avenue at 3050 International Blvd., for $3.25 million. Then, Oakland spent another $425,000 demolishing the dealership building for a total taxpayer cost of $3.6 million. At the time, city staff wrote in reports to the council that a "mixed housing type residential" project, including commercial retail and residential apartments, condos, or townhomes, would be the best use of the Derby Avenue portion of the property. A recent independent appraisal done for the city also concluded that housing would constitute the "highest and best use" of the site. But in 2015, Pacific West Communities, which specializes in building charter schools and affordable housing, approached city staff with an unsolicited plan to buy the land and assemble it with other adjacent, privately owned parcels to build a charter school for Aspire. Staff never issued a request for proposals to invite other developers to bid on the property. One of the other adjacent parcels Pacific West Communities ended up buying in September 2016 — after the city council approved exclusive negotiations with the company for the charter school — had a five-unit rent-controlled apartment building on it. Pacific West Communities demolished the building in late 2016, according to building department records. The city council is scheduled to hold a hearing this week in committee about whether to finalize the land sale to Pacific West Communities for the charter school, and critics — including Hutchinson — say they're going to oppose it. Zisser said the controversy underscores the need for some kind of final public lands policy. 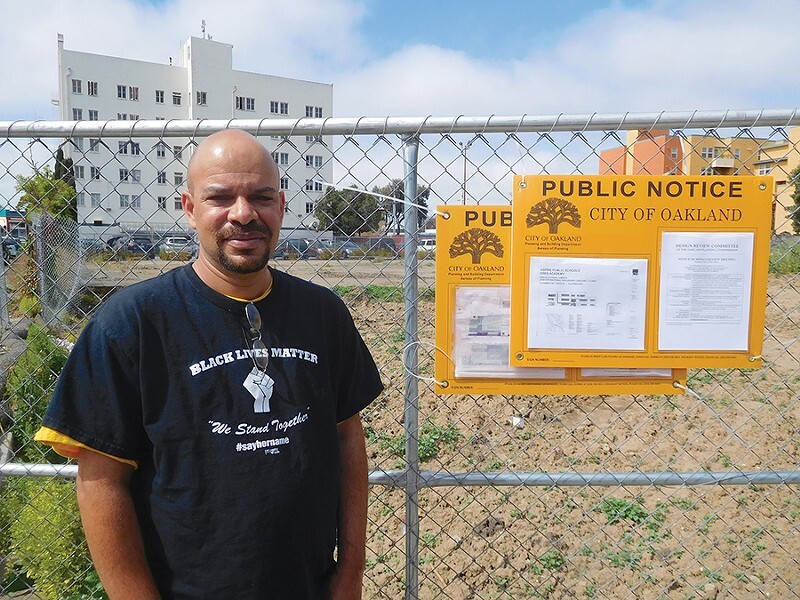 "As this drags out, the city council doesn't have a good view of what it should do, and we're continuing to lose valuable public land that could be used for affordable housing," he said.